The Dodge Nitro was based on the best-selling 2007 Jeep Liberty, with elements of the 2008 Liberty as well as unique features, such as a new 4.0 liter V6 engine (the base engine was the 3.7 liter V6). Transmissions were a six-speed manual or an automatic – four speeds for the 3.7 and five speeds for the 4.0. The Nitro suspension was retuned to suit on-road drivers, and the comfort level was generally higher (for the 2011 model year, the suspension was altered for better performance). The Dodge Nitro SUV was longer than the Liberty, could tow 5,000 pounds, and had an optional sports suspension package (standard on the Nitro R/T and optional on the SLT). A new feature, the sliding cargo floor, let owners slide out the cargo bay floor 18 inches for easier loading; it held up to 400 pounds. The Nitro also had a fold-flat front-row passenger seat. Nitro and 2008 Liberty were created at the same time, according to engineer Bob Sheaves. One of the reasons why the Nitro came before the refreshed Liberty was the addition of a tire-chain requirement on Liberty, which resulted in various changes to its architecture — but no changes to the inner wheelhouse opening, which is the same on Nitro and Liberty. (The braking systems are on the other side of that opening, on the driver’s side). The 2011 Dodge Nitro gained numerous standard features, including 20″ wheels, a new performance suspension, nine-speaker Infinity satellite audio system with voice command, monotone slate interiors, and body color grille with bright inserts. Over half of sales are expected to go to the well-equipped, but base, Heat model, with the rest split between Detonator and Shock. The upper two models have diagonal Dodge fender stripes, with Detonator getting color-matched fabric inserts and stitching, and Shock getting leather seats (heated in front). 2010 Dodge Nitro got active head restraints, interactive Decel Fuel Shut Off (iDFSO) (3.7/4-spd only), Fuel-Saver with “ECO” lamp indicator in cluster, power heated manual folding mirrors, air filtration system, and premium seat trim with stain-repel seat fabric. SXT got new leather trim, body-color grille with air dam, front-passenger express-up power window, and security alarm. Light Sandstone Metallic replaced Light Graystone outside; a new dark pebble beige is available on SE, with a new pastel pebble beige on SXT. The 2009 Dodge Nitro got suspension updates for better cornering, a change to one blue color, and bright red replacing electric blue paint. Floor mats, rear dome lamp, automatic transmission, and automatic unlocking became standard across models; remote express-open front windows became standard on SLT and R/T. The 4.0 V6 muffler was retuned; the suspension was retuned with updated rear axles and shafts, springs, shock, roll bas, and steering gear for more precise handling and feel. The brakes got a retuned booster, low-rollback calipers, and revised pedal ratio for better feel. Various packages were also changed, particularly in the electronics arena. Don Wagner wrote that the CRD Nitro (for Europe) centered the backup lights in the cluster instead of at the bottomthe front bumper was smoother across and the lower fascia air dam was better integrated into the front end; there were side marker turn signal repeaters just aft of the front fender flares; and the VIN had an 8 in the year position. The common-rail diesel engine was named Panther, and displaced 2.8 liters. It was coupled to a five-speed automatic or six-speed manual, and delivered 177 hp (130 kW) and 303 lb-ft of torque (410 Nm). Gas mileage was about 34 mpg highway (6.9 l/100km), 27 mpg combined (EU standard, 8.6 liters/100 km) with the manual transmission. The 2007 Nitro had three trim levels, SXT, SLT, and R/T. The R/T includes a performance suspension, 20-inch tires, and chrome-clad aluminum wheels (all three are optional on the SLT). The base SXT start at $19,885 (rear wheel drive); the SLT at $23,295; and the R/T at $25,970. Four wheel drive was about $1,600 extra. We test drove the SLT an expect the 4.0 liter version to be a real rocket in everyday driving – with instant-on acceleration beyond what sprint times would indicate. Gas mileage in 2010 was 16/22 for the rear-drive 3.7, 15/21 for the 3.7 4×4; 16/21 for rear-drive 4.0, and 16/20 for 4×4 4.0. The 4.0-liter SOHC V-6 engine, an enhanced version of the 3.5 V6, delivered 255 hp (190 kW) at 5,800 rpm and 265 lb.-ft. torque (360 N•m) at 4,200 rpm. The engine provides more power and torque than the 3.5 with emphasis on low- and mid-range operation to meet the needs of the day-to-day driver. For 2010, power output rose to 260 hp (194 kW) at 6,000 rpm, while torque stayed constant. The 3.7-liter SOHC V-6 engine produces 210 hp (157 kW) @ 5,200 rpm and 235 lb.-ft. (319 N•m) @ 4,000 rpm. Refinements in the valve train and combustion chamber enhance low-speed torque while providing a smooth idle and minimal engine noise. Electronic Throttle Control (ETC) tailored throttle response to pedal movement based on operating conditions. On August 15, 2006, the Dodge Nitro entered production. It was made on the same line as the Jeep Liberty, with a $600 million investment that added 150 robots and expanded the plant by 160,000 square feet. The Toledo North Plant was retooled to manage building two different models on one production line and to improve quality, productivity, and worker ergonomics, part of $3.9 billion spent on Toledo manufacturing capabilities that include $1.2 billion to build Toledo North (opened in 2001) and $2.1 billion for Chrysler’s Toledo Supplier Park, home of the 2007 Jeep Wrangler and Wrangler Unlimited. At the core of the new flexible manufacturing process is a body shop with 150 robots instead of the vehicle-specific heavy tooling that was previously used. The door, hood and liftgate assembly system is new, as are the side aperture assembly systems. Only the robots’ “hands” need to change to build the different models, and that is done automatically, within the time it takes to cycle from one vehicle to the next. TNAP can vary production between two products anywhere from 0 to 100 percent of each model. A third model can also be piloted — or test-built — at the same time, helping reduce the time needed to make new-model changeovers. New methods of material flow helped deal with building two models on one assembly line. An inbound parts sequencing center housed in the adjoining Stickney complex managed more than 1,800 different parts used in the Liberty/Nitro and Wrangler. In addition to sequencing, this center provided parts metering, kitting and container management to both Toledo plants. A significant portion of TNAP was be fork-truck-free as dollies provided materials to production areas, improving safety and productivity. The Dodge Nitro features an independent front suspension and an five-link rear suspension, neither of which was carried over from the Liberty. The independent front suspension gives the driver an optimum combination of ride, handling and steering, providing a greater sense of control and precision. The solid five-link rear suspension, including upper and lower trailing links and track bar, provides higher lateral stiffness for vehicle responsiveness and outstanding handling. Ample suspension wheel travel is provided to maintain consistent ride quality, especially when the vehicle is loaded or towing a trailer. The new performance suspension offered on the Dodge Nitro R/T and SLT models features a revised sway bar, springs, shocks, bushings and 20-inch tires and wheels for improved cornering and increased traction. Effort, feel and response on the Nitro’s rack-and-pinion steering system is tuned to give the driver precise control and positive feedback from the steering force exerted by the tires. The steering linkage design allows for a tighter turning circle. The six-speed manual transmission was standard on the Dodge Nitro 4×2 and 4×4 models with the 3.7-liter V-6 engine. For smooth operation, first and second gears have triple-cone synchronization, the third and fourth gears feature double-cone and the fifth and sixth gears single-cone synchronization. Hard-finished gears allow for quiet operation. A multi-rail, steel-construction shift system delivers high strength and precision. The two-piece aluminum case with integrated clutch housing assures powertrain stiffness and low weight. The new first-gear ratios combined with six-speed step spread allows optimization of axle ratios for fuel economy and performance. Transmission ratios for the six-speed manual are 4.46, 2.61, 1.72, 1.25, 1.0, and 0.84; reverse is 4.06. The four-speed variable line pressure automatic transmission was optional on the Dodge Nitro and standard on the Dodge Nitro SLT; it was used with the 3.7 liter engine. Transmission ratios are 2.84, 1.57, 1.0, and 0.69, with a reverse of 2.21. The five-speed automatic transmission was mated to the 4.0-liter V-6 engine; it features Electronic Range Select (ERS) interactive shift control. The shifter provides fully-automated shifting when in the Drive position, or the driver can manually select each gear by moving the shifter left and right from the Drive position (it’s also known as AutoStick). Transmission ratios for the five-speed automatic are 3.59, 2.19, 1.41, 1.0, 0.83, and Reverse 3.16. On 4×4 models, a part-time four-wheel drive system came with the manual transmission; a full-time all-wheel drive system came with automatic transmissions. Two-wheel drive and all-wheel drive modes were electronically controlled by a switch in the center console which can be selected at any time with the part-time four-wheel drive system. Nitro came with four-wheel disc anti-lock brakes; front rotors have inverted hat construction (vent openings are on the outboard side of the rotor) to improve cooling compared to conventional inboard venting. This also helps to minimize high-temperature deformation for long-term smooth operation. The Brake Traction Control System (BTCS) transfers torque from one wheel to another on the same axle when wheel slip conditions are detected. Electronic Stability Program (ESP) aids the driver in maintaining vehicle directional stability in severe driving maneuvers on any type of surface. Using signals from sensors throughout the vehicle, ESP determines the appropriate brake and throttle adjustments for directional stability of the vehicle. Other safety and control systems are electronic roll mitigation and side-curtain airbags. The 2007 Dodge Nitro will be produced at the Toledo (Ohio) North Assembly Plant alongside (or mixed in with) the Jeep Liberty. A new feature comes on SLT and R/T models: the LOAD ’N GO™ cargo floor that slides 18 inches rearward for easy and convenient loading and unloading of packages, and can hold up to 400 pounds. It is made of a heavy-duty plastic for easy cleaning. A compact utility table is an available option on the Dodge Nitro model. Other available options include a DVD-based navigation system with traffic data update, rear-seat DVD entertainment system, AM/FM/6-disc/DVD/MP3 audio with premium speakers with a subwoofer, remote start, UConnect, and Sirius Satellite Radio. Nitro designers used strong and confident themes. Intrinsic to every Dodge vehicle is the bold crosshair grille (body color on the R/T and chrome on the others), with a three-dimensional ram’s head. Rectangular headlamps that prominently wrap the corners of the vehicle and a clamshell hood complete the front-end. The side features a deep-body section and high beltline. Chrome vents positioned on each front fender add to the flair. The wheels, pushed to the corners for better ride and handling, are surrounded by bold wheel arches. Standard on the Dodge Nitro R/T and optional on the Dodge Nitro SLT are 20-inch tires and chrome-clad aluminum wheels. The side-view mirrors were developed in the Chrysler Group wind tunnel in Auburn Hills, Mich., in conjunction with the form of the A-pillar. The result is an aerodynamically efficient design that minimizes wind noise, helping to create a quieter cabin. The door handles have a solid, strong feel and are easy to grip, even with a gloved hand. In the center of the door handle is a deep, horizontal groove, a design cue that is repeated inside on the map pocket, door panels and instrument panel. Dodge designers chose to black-out the C-pillar of the vehicle which makes the second-row and rear-windows appear more horizontal, amplifying the vehicle’s sporty nature. The rear features beveled taillamps and a lighted license visor. The front fascia, headlamps, rear fascia and taillamps are designed to meet international requirements. The interior of the five-passenger Dodge Nitro is spacious, functional and flexible for people and cargo. The headliner is shrink-wrapped to allow maximum headroom and there is plenty of leg room for first- and second-row passengers. A three-pod, four-gauge instrument cluster is designed for right- or left-hand drive. The chunky steering wheel gives the driver a perception and feeling of a bigger vehicle. The instrument panel is nearly identical to that of the Avenger/Sebring in basic form, as is the center stack; we wonder if Chrysler is actually using some of the same parts across both vehicles. Brushed silver accents appear on the door handles, center console, gear shift and HVAC controls. The Dodge Nitro SLT and Dodge Nitro R/T receive additional chrome detail on the steering wheel, instrument cluster, first-row grab handle and center console. The gear shifter and control buttons are substantial in size and bold by design. The center console storage bin is deep and wide enough to house CDs or DVDs and has a tray that sits atop it for additional storage. The center console offers three spaces that can accommodate hand-held PDAs, cell phones or coins. The driver- and passenger-side doors each have deep compartments; behind the driver’s seat is a wide and easy-to-reach map pocket. Two cup-holders are located in the first and second rows. A choice of vinyl or cloth seats are available on the Dodge Nitro, with leather seats available on the R/T and SLT; the seat structure is new, thinner but more supportive. Standard on the Dodge Nitro SLT is the new YES Essentials® cloth seats, an advanced seating upholstery that offers three benefits: repelling stains, controlling odor and reducing static electricity. The technology is designed to withstand endless cleanings and should not rub off or change the texture or comfort of the seats or surfaces during ownership of the vehicle. The upholstery also controls bacteria-based odors inside the vehicle. The Dodge Nitro has a fold-flat front passenger seat, as well as fold-flat second-row seats. The second-row seats also recline for added passenger comfort. Standard on the Dodge Nitro SLT and Dodge Nitro R/T is the LOAD ’N GO™ cargo floor which slides 18 inches rearward for easy and convenient loading and unloading of packages. The LOAD ’N GO cargo floor can hold up to 400 pounds and is made of a heavy-duty plastic for easy cleaning. A compact utility table is optional. The Dodge Nitro features two new exterior colors — Sunburst Orange and Electric Blue. Also available will be Inferno Red, Light Khaki, Bright Silver, Black and Stone White. Emission Controls 2, mini-oxidation & 2, 3-way catalytic converters; 4 heated oxygen sensors. 50-state ULEV II. The four wheel drive versions have two transfer cases, depending on the transmission. Manual transmissions get the MP143 GII single-speed transfer case that offers part-time four wheel drive (normally it is two wheel drive), with a 50/50 torque split. Automatics get full-time four wheel drive with a planetary center differential and a 48/52 front-rear torque split. The 2011 Jeep Liberty Jet appearance package for Liberty Sport and Limited was launched in November 2010, and includes 20 inch polished aluminum wheels, P245/50R20 all season radials, blacked-out headlamps, and chrome in the lower fascia opening, body side moldings, license plate brow, roof rails and mirror caps. Colors are Bright Silver, Dark Charcoal, Brilliant Black, and Blackberry. Standard in the Jeep Liberty Jet are a 9-speaker premium audio system, side-curtain air bags, and rear park assist. Options include dark leather seating with accent stitching; heated power front seats; leather-wrapped steering wheel with audio controls; and one-touch up/down power windows. The Liberty Jet option package was listed at $1,495 to Liberty Sport and $995 to Liberty Limited models on launch. The Dodge Nitro and 2008 Jeep Liberty “KK” (KK is the body code, vs KJ on the prior Liberty) were created at the same time, according to engineer Bob Sheaves. One of the reasons why the Nitro came first was the addition of a tire-chain requirement on Liberty, which required changes to its architecture — but no changes to the inner wheelhouse opening, which is the same on Nitro and Liberty. (The braking systems are on the other side of that opening, on the driver’s side). 2010 Jeep Liberty got active head restraints, interactive Decel Fuel Shut Off (iDFSO), Fuel-Saver with “ECO” lamp indicator in cluster, power heated manual folding mirrors (Sport model), standard air filtration system, standard premium seat trim with stain-repel seat fabric and front-passenger fold-flat seat, and standard larger floor mats. Limited got standard front-passenger express-up power window, Uconnect™ Phone, leather, heated front seats, and power driver and passenger seats with manual lumbar control. A new graystone paint was added. The 2010 Jeep Liberty Renegade was launched in January 2010; the name Renegade first appeared in 1964 on the inside door opening of the Jeep Wagoneer and has been the off-road-readied Liberty. The current Liberty Renegade is priced between the Sport and Limited; it has the Selec-Trac® II full-time, shift-on-the-fly, active four-wheel-drive system. Selec-Trac II uses an electronically controlled two-speed active transfer case and Brake-Traction Control System (BTCS). It instantly anticipates wheel slip and redirects torque accordingly, which is ideal for off-roading or when driving in inclement weather. The system has an automatic mode for regular driving; it uses sensors to adjust and redirect torque between front and rear axles based on real-time driving conditions. It also has a low-gear mode, which multiplies engine torque 2.72 times and locks the clutch pack for maximum traction. Shifting is done via a console mounted switch, with a button to shift to Neutral. The Renegade has Mineral Gray Keystone 16-inch wheels with all-terrain P235/70R16 outline white letter (OWL) tires; dark neutral metallic wheel flares, lower side sills, front and rear fascia, body side moldings and rear license plate bar; black headlamp bezels; argent silver accents on the lower fascia appliqué and roof rack; black satin vinyl hood graphics; deep-tint glass; fog lamps; skid plates and tow hooks. Inside are premium cloth seats; leather-wrapped steering wheel, shift knob, instrument panel grab handle and park-brake boot; driftwood accent bezels; leather-wrapped center console and soft-door armrests; Electronic Vehicle Information Center (EVIC); cruise control; security alarm; rear cargo cover and steering-wheel-mounted radio controls. Jeep Liberty Renegade is sold in a new, Renegade-exclusive Salsa Red Pearl Coat exterior, as well as Natural Green Pearl Coat, Deep Water Blue Pearl Coat, Bright Silver Metallic Clear Coat, Brilliant Black Crystal Pearl Coat and Stone White Clear Coat. The second generation 2008 Jeep Liberty went into production on July 24, 2007. The Jeep Liberty has two Trail Rated® four-wheel-drive systems – Command-Trac® and the Selec-Trac® II – and on-road ride and handling have been improved with the new independent front suspension, five-link rear suspension, and rack-and-pinion steering. The interior returns to the squarish Cherokee look, enhanced by the new Sky Slider™ full-open canvas roof, giving the Jeep Liberty an open-air experience. See our Auto Show coverage for introduction photos and information. Inside, cargo and storage space increased and seat comfort improved; remote start, rain-sensing wipers, memory seats and mirrors, and express up/down windows were added. The six speed manual and four-speed automatic transmissions continue. The standard 3.7-liter SOHC V-6 engine produces 210 hp (157 kW) @ 5,200 rpm and 235 lb.-ft. (319 N•m) of torque @ 4,000 rpm. Fuel economy (with the standard – and only – V6) was improved by about 2 mpg with either stick or automatic; it is now an estimated 16 city (18 mpg using 2007 EPA standards), and 22 mpg on the highway (23 mpg based on 2007 EPA standards). Wind drag remains high but is now lower than the Dodge Shadow; the improvement in aerodynamics may have counteracted the increase in weight. The Renegade is no longer available, at least not at launch. Starting price at launch is $20,990 for rear wheel drive and $22,600 for four wheel drive, including destination, over $1,000 less than the 2007 base model despite extra features. The Limited starts at $25,175 (RWD) and $26,785 (4×4). The 2008 Jeep Liberty has safety systems including standard electronic stability control, electronic roll mitigation, all-speed traction control, brake assist, anti-lock brakes, rain sensing wipers, tire pressure monitoring, and side-curtain air bags. The diesel in the prior generation Liberty exceeded their sales expectations, but standards changed for 2007, and they decided to move to a bigger engine and put it into the Grand Cherokee. The 2.4 engine was never well received, and the power to weight ratio was too low; most buyers get four cylinders for better gas mileage, but real-world fuel economy wasn’t much better with the 2.4. The V6 provides a better combination of performance and mileage; and dropping the 2.4 simplified their build processes. The 3.7 was used instead of the 3.8 largely due to production capacity. The four speed automatic was kept partly because keeping the powertrain unchanged helped them to focus on the key elements that needed work. Most people were happy with the 3.7/four-speed combination, which has been reliable; the focus was on what needed to be changed most. This included ride quality, moving the window switches back to the doors, and adding cargo space without much extra length. People like the Liberty partly because it’s small on the outside; by moving the spare underneath, they could add to the length of the enclosed portion of the car, and lengthening it by two inches provided extra space for the rear seat as well. In addition, the mechanical transfer case worked well but many women did not like it due to the effort required, so they moved to an electronic shift, which is much easier. We also asked how, with greater weight and the same powertrain, and a similar though improved drag coefficient, the Liberty could increase its gas mileage fairly substantially. According to Rick, this was largely a matter of reducing rolling resistance, increasing aerodynamic efficiency, and cutting parasitic losses. In particular, brake-specific fuel consumption was reduced through a different usage of EGR; and the electronic throttle helped to tighten engine control for a little more efficiency. Overall, Rick felt that real world gas mileage increased even more than EPA estimates. Our next question had to do with styling, so Rick called over Ralph Gilles, who remains friendly and approachable despite his auto-world fame. We wondered about the risk Jeep was taking in so dramatically restyling a vehicle which has been an unquestionable hit, going from a more curvy style to the more rugged, blocky style; in particular, since most Liberty buyers have been women, we wondered if that would be an issue. Ralph responded that historically, women will buy a man’s car; what they liked about the Liberty was mainly the manageable size, which made it easy to park, fun to live with, and easy to own. It now looks more capable and rugged, which should appeal more to men, while still keeping the form factor liked by its current buyers. One styling cue he pointed out was the round headlights behind squarish lenses; they made the lamps oversized to scale the vehicle and keep it looking small and playful; the roundness gives it personality, the squareness ruggedness. For 2009, manual transmissions were dropped; but Sirius Radio and six speakers are standard on Sport, floor mats are standard across the board, and YES Essentials cloth seats are in the Popular Equipment Group for Sport. Two new colors, orange and deep-water blue, replace electric and modern blue. The overwhelming majority of Libertys sold were the Sport model; the tweaks to the Limited may have been an attempt to increase high-end sales by making it more worthwhile. The 2008 Jeep Liberty offers the MyGIG Multimedia Infotainment System™ an audio, navigation, entertainment, and pphone system which allows customers to use touch screen or voice commands to control features, and includes a 20-gigabyte hard drive where music, photos, and voice memos can be stored. MyGIG supports real-time traffic information, available through satellite radio, and can provide an alternate drive route based on traffic conditions. All of these functions can be controlled through voice commands and by utilizing a touch screen. SIRIUS Satellite Radio provides U.S. customers with 130 channels, including commercial-free music, sports, news, talk, entertainment, traffic and weather. UConnect® uses Bluetooth® technology to provide wireless communication between the customer’s compatible mobile phone and the vehicle’s on-board receiver. The 2008 Jeep Liberty is produced at the Toledo North Assembly Plant (TNAP) in Toledo, Ohio, alongside the Dodge Nitro. The plant can make both models on one production line with near-zero swap time between two vehicles. The investment of $638 million included multiple plant upgrades, improving quality, productivity and worker ergonomics. More than 160,000 square feet were added to the plant floor to enhance body and assembly processes. At the core of the new manufacturing process is a body shop comprising 150 new robots instead of the vehicle-specific heavy tooling that was previously used. The door, hood and liftgate assembly system is new, as are the side aperture assembly systems. Only the robots’ end effectors, or “hands,” need to change in order to build the different models. That tool change is done automatically, within the time it takes to cycle from one vehicle to the next. TNAP is flexible enough to vary production mix between two products anywhere from 0 to 100 percent of each model. A third model can also be piloted — or test-built — at the same time, helping reduce the time needed to make new-model changeovers. New methods of material flow are being implemented to manage the complexity of two models being built on one assembly line. An inbound part sequencing center is housed in the adjoining Stickney complex and manages more than 1,600 different parts that are used in the Dodge Nitro, Jeep Liberty and Toledo Supplier Park’s Jeep Wrangler two-door and Jeep Wrangler Unlimited four-door build processes. In addition to sequencing, this center provides parts metering, kitting and container management to both Toledo North and Toledo Supplier Park Assembly Plants. Additionally, a significant portion of the TNAP facility is fork-truck-free, as dollies provide materials to production areas, improving both employee safety and productivity measurements. A new workplace organizational model, called Smart Manufacturing, is increasing the flexibility of the TNAP workforce, while fostering greater creativity and innovation from plant employees. This model is being implemented throughout the Chrysler Group’s Manufacturing organization. In addition to extensive training, the new workplace model lets employees design their own workstations. These changes provide a better work environment for employees and give increased support to assembly line team members. The 2.1-million-square-foot Toledo North Assembly Plant occupies 200 acres and has more than 2,700 employees working two shifts, with the third shift of approximately 750 employees to begin in the third quarter. Groundbreaking of Toledo North began in fall 1997. A third Chrysler Group plant is located in nearby Perrysburg, Ohio. The Toledo Machining Plant opened in 1967 and produces steering columns and torque converters. New for Jeep Liberty and standard on 4×4 models is Hill Descent Control (HDC). Operational in the “4WD Low” position, HDC provides downhill assistance at a controlled rate of speed. By means of electronic brake control, HDC supplements the gear reduction and engine braking that a traditional mechanical low-range transfer case provides. Liberty’s HDC is activated and deactivated automatically, after the HDC button is engaged, as the system senses changes in topography. The system works whether the vehicle in forward or reverse. Standard on all Liberty models, Hill Start Assist (HSA) allows the driver time to transition from brake to throttle to achieve a smooth launch on a grade. The system will hold brake pressure for two seconds upon the driver’s release of the brake pedal. The Anti-lock Brake System (ABS) system decreases wheel pressure in response to increasing throttle to provide a smooth launch. As with all Jeep vehicles, Liberty features an ABS with Rough Road Detection. This system is capable of detecting when the vehicle is driving on a rough road by the oscillations in the wheel-speed signals. A rough road is detected on off-road surfaces or trails, which signals the ABS to hold the brake pressure for longer pulses. With a longer pressure pulse, the deformable surface of the rough road will form a wedge in front of the tire and assist in slowing the vehicle. The Jeep Liberty also has Trailer Sway Control, Tire Pressure Monitoring (TPM) and rain-sensing wipers. Trailer Sway Control reduces trailer sway, providing improved trailer stability and increased towing safety. The TPM system informs occupants if tire pressure is too low by utilizing pressure-sensor modules within the valve stems of all four road wheels. Jeep Liberty’s rain-sensing wipers automatically sense moisture on the windshield and activate the wipers. The Jeep Liberty is designed to appeal to customers who are looking for Jeep 4×4 capability as well as comfort and convenience. It is targeted to young couples and new families, as well as professional, young single men and women between 30 and 40 years of age, balanced male to female. Jeep Liberty owners will balance day-to-day responsibilities with their passion for adventure as well as the outdoors. They are athletic, and pursue activities that combine their various interests with their active lifestyle. The Jeep Liberty will be available at Jeep dealerships starting in the third quarter of 2007. The 2011 Jeep Grand Cherokee was a major launch of Chrysler; the first after the departure of Cerberus and Daimler, it represented what was to come, with far higher standards for the new engine, the suspension, and the interior. Journalists almost universally praised the new Grand Cherokee, which swept numerous awards and put Chrysler back on the map. The standard engine is the smooth 290 horsepower Pentastar V6, which gets just 1 mile per gallon less than the diesel-powered Mercedes ML350. The Hemi is optional across the board, and Europeans have a new 237-hp VM Motori 3-liter V6 diesel; all use the W5A580 five-speed transmission. Thanks to the Hemi option, the V6 has a large engine bay, with around five inches in front of the serpentine belt. For 2012, Hemi models move to a six speed automatic; various wheel and option package changes were made, as well. The Dodge Durango is an extended-wheelbase version; and the architecture will be adapted by Maserati. [Allpar was first to report this, in November 2010.] The Jeep Grand Cherokee SRT8 and Maserati versions reportedly have quad exhaust, different 20” wheels, and different suspension components. The independent front and rear suspensions have isolated cradles. Variable-rate rear springs improve on-road handling and comfort, and the spare tire is stored inside as opposed to underneath. Torsional rigidity has been increased 146%. The 2011 Jeep Grand Cherokee Laredo, with a new, upscale interior, advanced four wheel drive system, 290-horsepower Pentastar V6, five-speed automatic, numerous standard features, and towing capability, started with a U.S. list price of $32,995 including destination. Give up the four wheel drive, and the price dropped by $2,000 on the Lardeo, $2,500 on the Limited, and $3,500 on the Overland. Add a V8, and towing went from 5,000 to 7,400 lb (when properly equipped). Dealer invoices were set close to the list prices (excluding holdbacks), so there’s not much negotiating room. A Grand Cherokee Laredo, the well equipped base model, was listed at $32,995 with no options; the dealer cost was $31,402, with a $966 dealer holdback. The Friends & Family Program dropped retail down to $31,088. The 4×4 ran $32,995 list — $31,402 invoice. The Jeep Grand Cherokee Limited 4×4 listed at $39,600; the dealer invoice price was $37,402. The Hemi V8 engine added $1,495 list, $1,331 invoice; aluminum painted wheels ran to $1,095 (list), the hard drive/navigation system stereo added $750; and the trailer towing package added $695. Dealer invoice for options varies quite a bit, with a hefty profit on some options but a narrow profit on most. 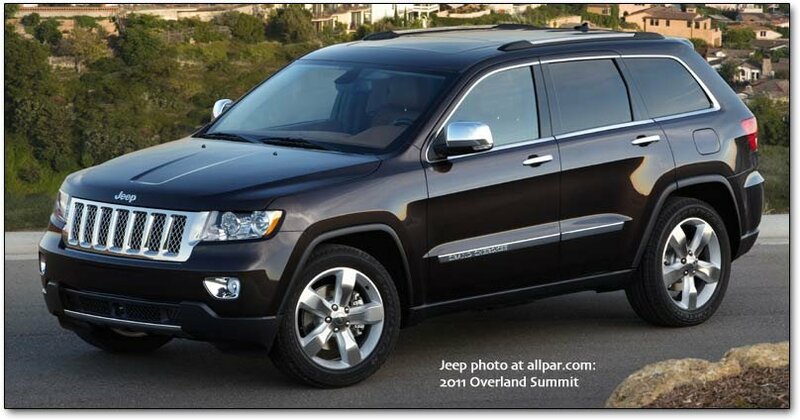 Announced at the L.A. Auto Show for sale in December 2010 was the 2011 Jeep Grand Cherokee Overland Summit, which added more luxury to the already luxurious Overland model. Available in an exclusive Rugged Brown paint scheme (as well as gray, white gold, and black), it has a chromed grille and fog lamp bezels, with 20-inch bright, polished aluminum wheels. The interior has real Black Olive burl wood trim blended into the instrument panel, the standard heated steering wheel, and the upper panels of both front and rear doors. The interior is two-toned, black and New Saddle, with saddle-color Nappa heated and ventilated leather seats, and Berber floor mats with Black and Chestnut accent binding. Standard features include Adaptive Cruise Control, Forward Collision Warning, Blind Spot Monitoring and Rear Cross-path detection systems. The Grand Cherokee Overland Summit edition listed at launch at $42,495 (plus $780 destination) for 4×2 models, and $45,995 (plus $780 destination) for 4×4 versions. The new V6 increases highway gas mileage to 23 mpg highway (22 mpg with 4×4) — over 500 miles per tank — though city mileage fell 1 mpg. The interior provides over four inches of increased rear-seat knee and leg room, and 17 percent more cargo volume (as released first on allpar.com). Numerous safety features are standard, and options include Blind-spot/Rear Cross-path detection and Adaptive Cruise Control with Forward Collision Warning, along with FloTV, satellite TV, and Internet router. All three trim levels can be ordered with Trail Rated configurations. The Laredo includes keyless entry, stability control with anti-roll, hill start assist, trailer sway control, side curtain airbags for both rows, active head restraints, power driver’s seat, fog lamps, leather-wrapped steering wheel with audio controls, satellite radio, and 17-inch aluminum wheels; the 360 horsepower Hemi V8 will be optional. That model starts at $32,995. The Limited adds Quadra-Trac II® with Selec-Terrain (if you get the 4×4), front and second-row heated leather seats, memory settings, High Intensity Discharge auto-leveling headlamps, CommandView dual-pane panoramic sun roof, rear back-up camera, rear park assist, premium audio, automatic temperature control, 18-inch aluminum wheels, Garmin® navigation, rain-sensitive wipers, and bright door handles. The price for Limited is $39,995 including destination. The ultimate Grand Cherokee, the Overland model, adds a premium interior with Nappa leather-trimmed and heated seats, vented front seats, wood/leather-wrapped heated steering wheel with memory, power tilt/telescope steering column, real wood bezels, leather-stitched instrument panel/doors/center console armrest, power liftgate, and 20-inch aluminum wheels. That model starts at $42,995 including destination. Phil Jansen, Grand Cherokee Chief Engineer, said that the front limited slip differential was dropped because “we developed our Quadra-Drive II system with a variable transfer case, rear electronic limited slip differential, better brake limited differential performance, and larger brakes to provide better traction performance than our prior system with electronic limited slip differential. He also said that the Grand Cherokee was designed and developed before the Fiat partnership. The front suspension is a long/short arm design; the rear is a multi-link design. The Quadra-Lift air suspension system, optional on 4x4s, has five height settings. Two are for off-road use (raising 1.3 and 2.6 inches above normal, to a maximum 11.1 inches of ground clearance), one lowers the car half an inch for better aerodynamics, one is normal, and one lowers the car by 1.5 inches for entry and exit. Using a reservoir tank and pressures of 220 psi, Quadra-Lift operates four-corner air springs automatically, or via console controls, with 4.1 inches of travel and continuous load levelling. The Aero control is automatic and speed-controlled. The approach, departure, and breakover angles are all improved over the 2009 Grand Cherokee, along with maximum ground clearance (with the air suspension). These angles are superior to those of the 2010 Equinox, Highlander, Pilot, and 4Runner (except ground clearance without Quadra-Lift). See our specifications page for approach, departure, and breakover angles, compared with competitors. Two off-road groups are available; group I includes Selec-Terrain, a four wheel drive transfer case with low range, tow hooks, and skid plates. Group II includes those features and adds QuadraLift. Off road groups are not available with 20 inch wheels; 18 inch wheels are substituted. Quadra Trac I has full-time four-wheel drive, with a proven, light-weight single-speed transfer case, and a fixed torque distribution of 48/52 front/rear with brake-limited differentials. Quadra Trac II has a two-speed transfer case and uses Throttle Anticipate to sense quick movement in the throttle from a stop and maximizes traction before slippage occurs. When tire slippage is detected, all available torque can be routed to the axle with the most traction. Quadra Drive II has a rear (and rumored front in the future) Electronic Limited-Slip Differential which detects tire slip and sends torque to tires with traction. As with Quadra Tac II, in some cases, the Jeep will anticipate low traction and proactively limit or eliminate slip. All 2011 Jeep Grand Cherokees equipped with either the off-road or the Quadra-Lift group are Trail Rated® which means it passed off-road conditions in traction, ground clearance, maneuverability, articulation, and water crossing. The battery uses Absorbent Glass Mat (AGM) technology battery, which has stiffer separators holding the electrolyte in place; as a result, the cells do not leak even if the case is cracked, and the battery can withstand severe shock and vibration. It is a sealed unit, with relief valves running from its position under the passenger seat to the outside. The negative terminal can be removed for repairs on electrical systems (e.g. airbag replacement) by moving the seat forward and taking off the cover, which, according to Allpar member codypet, takes some work. There are remote jump-start posts under the hood. The interiors have better craftsmanship, with soft-touch, premium materials and genuine wood trim; all models have bright chrome accents. The Keyless Go system, optional on some models and standard on others, unlocks and locks the doors without a fob. The CommandView sunroof has fixed glass panels above both rows of seating, with an express power shade to cover it. Compared with the outgoing Grand Cherokee, the 2011 Jeep has 4 inches more rear seat leg room, with 12° of recline, a standard center folding armrest and rear seat vent controls, and 17% more cargo capacity… with the spare tire now mounted inside. The base engine is a new 3.6-liter V-6 engine pumping out 290 horsepower and 260 lb.-ft. of torque (353 N•m) @ 4,800 rpm; 90% of peak torque is available from 1,600 to 6,400, so it’s not a “peaky” or “paper horsepower” engine. The new Jeep Grand Cherokee V6 is not only more powerful – by 80 horses – but gas mileage is 11% higher. The V6 Grand Cherokee has more horsepower than Toyota Highlander, Honda Pilot, and GMC Acadia, with more torque than Highlander or Pilot, and similar gas mileage to all three competitors (within 1 mpg) according to Chrysler Canada’s materials. Towing is rated at 5,000 lb with the V6, similar to or more than the Toyota Highlander, Honda Pilot, and GMC Acadia; but goes up to 7,200 lb with the Hemi V8 (equipped properly). The Pentastar V6 is attached to the Mercedes W5A580 five-speed automatic, with Chrysler’s controls and the driver-interactive control. The gas tank has been increased to 24.6 gallons, which allows for a range of around 500 miles. The Hemi V8 uses cylinder deactivation to increase mileage, and is (we believe) coupled to the reliable, smooth Chrysler-designed 545RFE five-speed automatic transmission, which has a sixth forward speed for highway kickdown. Outside the US, the 2011 Jeep Grand Cherokee is, as in the past, be sold in left- and right-hand drive with either diesel or petrol engines. The diesel engine was to be the Mercedes 3.0, but “Stratus” told us that was yanked in September 2009. “Stratus” was the first to reveal that the Grand Cherokee would use VM Motori’s brand new RA 630 DOHC engine, another 3.0 liter V6, with four valves per cylinder and common rail fuel injection. Power output for the diesel is higher than the outgoing Mercedes, while it is quieter, vibrates less, and gets considerably higher gas mileage (using 8.3 liter liters per 100 km, down from roughly 9.7). The new engine generates 237 hp and 406 lb-ft of torque — or 323 kW and 540 Nm. (Thanks, Stratus and Arditi.) This is far better mileage than the V6. Hill-Start and Hill-Descent modes help drivers to get started on a hill without rolling back, and to descend steep hills. The base model, the Laredo E, is a well equipped machine with standard passive entry/keyless go, new double dash construction with acoustic side glass, electronic stability (with hill start, roll mitigation, and trailer sway control), side curtain airbags in front and rear, front side airbags, front active head restraints, power driver seat, 17 inch aluminum wheels, fog lamps, power-adjusted heated mirrors, trip computer (with feature personalization), LED interior lights, and dual zone temperature control. Overall, the base model is as fully loaded as some top line models; but it is the only model that cannot be ordered with the Hemi. The Laredo X brings leather trim, heated front seats, power front passenger seat, 18 inch wheels, hard-drive based stereo with hands free phone system, 506-watt, 9-speaker Alpine stereo, remote starter, Park-Sense (rear distance detection), and alarm. The Limited adds a dual-pane panoramic sunroof, Quadra-Trac II, dual-zone automatic temperature control, heated first and secondrow seats, ventliated front seats, power liftgate, heated and tilt/telescope steering wheel, memory settings (for seat, mirrors, and radio), 18” shiny wheels, HID headlamps with SmartBeam, rear backup camera, and rain sensitive wipers. Finally, the Overland model (shown below) adds a unique interior, real wood/leather wrapped heated steering wheel, premium navigation system with voice recognition, and new 20” aluminum painted wheels. Options include the Hemi with bright dual exhaust, Class IV trailer tow group, Quadra-Drive II (Hemi only, July availability), and Quadra-Lift (July). Cargo capacity has increased 17% over the last model, with 36.3 cubic feet of space. The 2011 Jeep Grand Cherokee’s ruggedness is achieved with more than 5,400 welds in the body alone. Torsional stiffness is 146% more than the current Grand Cherokee and is stiffer than the BMW X5 and Toyota Highlander for improved durability and reduced noise, vibration, and harshness. With more than 3,700 mm of arc welding and 100 m of structural adhesive to augment welding, this marks a 53% increase in spot welds, a 42% increase in arc welds, and a 38% increase in structural adhesive. The new interior now features rich materials and elegant appointments, as well as more room for both passengers and cargo. An optional CommandView® dual-pane sun roof provides twice as much glass surface than a standard sun roof and extends from the windshield to the rear of the vehicle. The front panel may be opened rearward, providing additional light and fresh air to first-row passengers. The rear panel, which is fixed, allows light and open viewing for second-row passengers and comes standard with a power sun shade. The vehicle’s 114.8-inch wheelbase is 5.3 inches longer, but overall length is just 1.8 inches longer; coupled with three inches more width, the the size changes should improve cornering as well as interior space. Larger front door openings (1.9 inches wider; 2 inches higher) and rear doors that open 78° (vs. the old model’s 67 degrees) provide better access to the interior. Inside, premium seating includes room for five passengers. An available fold-flat front-passenger seat provides improved cargo storage room (Laredo models). Rear seats recline 12° and move forward 12° for 24° of variation. The cargo bay behind the rear seats has 6.8 more cubic feet of room (36.3 cubic feet total), and includes a storage unit with a rechargeable flashlight and new grocery hooks on both sides. The spare tire compartment includes removable dual storage bins for secure storage of muddy gear or other items. A new power rear liftgate is available. Engineers will conduct approximately 7.5 million customer-equivalent miles for durability and reliability testing of the all-new 2011 Jeep Grand Cherokee. Testing and validation in various climates include road trips to a variety of locations including Yucca, Arizona, Baudette, Minn. and Morgantown, West Virginia. A full battery of lab testing includes full-frame fatigue testing and a road-test simulator. The 2011 Jeep Grand Cherokee has gone through more than 244 hours of wind noise and aerodynamic evaluations. More than 3.3 million customer-equivalent miles were recorded on Pentastar engine dynamometers prior to production. Severity testing was increased 50% versus previous Chrysler V-6 engines — which have had strong durability — to accommodate high-load applications including trailer-towing. The reduction of noise, vibration and harshness (NVH) was a key objective for every component during the design phase of the engine and was achieved by utilizing an advanced computer-aided engineering technique. The use of a Quality Assurance Fixture (QAF) assures a high level of compliance at the start of production. The QAF allows engineers to look at the interior of the vehicle on a “simulated perfect body” which is a milled aluminum shell where all attachment points are matched exactly to CATIA modeling earlier in the program. This allows changes and design improvements earlier in the manufacturing process. The company also employs techniques of Design for Six Sigma (DFSS), which is folding in “voice of the customer” data along with lessons learned to ensure that every vehicle is of the highest quality. The 2011 Jeep Grand Cherokee is the first new vehicle to have more than 100 DFSS projects. Every surface of the all-new Jeep Grand Cherokee is new and has been treated for aerodynamics, improving drag by 7% and resulting in a cD of 0.37, down from 0.404. The removable lower front fascia delivers improved fuel economy, on-road performance and off-road capability. The lower front fascia features a large chromed appliqué (Limited and Overland models) that showcases available tow hooks. Black appliqués on B-pillars give the day-light opening (DLO) an aerodynamic, modern appearance and a sleek profile. Optional chromed mirrors and door handles add to the profile and complement the full-chromed DLO surround on all models. Taillamps wrap from the rear quarter panel to the back of the vehicle and create a solid form which achieves more of an upscale appearance. The treatment complements the front-end design and resonates with the rest of the exterior. Seventeen-inch wheels are standard, with optional 18-inch and new-to-Jeep 20-inch wheels for 2011. Jeep Grand Cherokee models equipped with a HEMI V-8 engine have 3.5-inch dual chromed exhaust tips, and those with the V-6 engine have a 3-inch single exhaust. Standard safety features include Electronic Stability Control (ESC), Electronic Roll Mitigation (ERM), four-wheel Anti-lock Brake System (ABS) with rough-road detection, four-wheel Brake Traction Control System (BTCS), Passive Entry/Keyless Go, Remote keyless entry, express up/down windows for driver and front-seat passenger, seat-belt pretensioners, Trailer-Sway Control and Remote-Start which is standard on Overland and available on Limited. The Brake Assist System recognizes emergency situations (by seeing how quickly the driver hits the pedal) and increases brake pressure; it’s based on research that shows that in many accidents drivers had panic-stopped without fulling activating the brake. Other standard safety features include standard full-length side-curtain air bags which extend protection to front and rear outboard passengers, seat-mounted side thorax air bags that enhance protection for the driver and front passenger, and active head restraints which deploy (move forward and up) in the event of a rear collision. The body structure is all new and designed to achieve expected safety performance in global markets (new roof-crush standards, side-impact standards and Euro pedestrian impact). The 2011 Jeep Grand Cherokee is built at the 2.7-million-square-foot Jefferson North Assembly Plant (JNAP) in Detroit, which has been the site of Grand Cherokee production since its introduction in 1992. The Dodge Durango returns in model-year 2011, moving to the Jeep Grand Cherokee platform. Due to begin production in November 2010, the new 2011 Dodge Durango will have a 119.8 inch wheelbase — several inches longer than the new Grand Cherokee. Finally, the top end is the Durango Citadel, with heated and ventilated seats covered in perforated Nappa leather, visible stitching, chrome-plated wheels, blind spot monitor, high intensity discharge lights, and a unique chrome grille, along with other items. Options include sunroof, engine block heater, roof rack with integrated, stowable crossbars, trailer towing package, skid plate group, and electronics group (including rear backup camera, rear parking assist, USB port, and upgraded radio). Options that require a particular model include Travel Link, rain sensitive wipers, tilt and telescope steering column, SmartBeam® headlamps, back seat television, forward collision warning, rear cross path detection, adaptive cruise control, hard drive based stereo, Capri leather with embroidered logo, eight-way power driver and passenger seats, and signal mirrors. Engines will be the new 3.6L Pentastar (with the Mercedes W5A580 5-speed auto trans) and the 5.7L VVT Hemi (with the proven Chrysler 545RFE five-speed transmission). The 3.6 is rated at 290 hp @ 6,400 rpm; and 260 lb-ft @ 4,800 rpm. Estimated EPA gas mileage is 16/23 (rear wheel drive) and 16/22 (all wheel drive). With the Hemi, power is rated at 360 hp, and 390 lb-ft @ 4,250 rpm; gas mileage is expected to be 14/20 (RWD) or 13/20 (AWD), with up to 7,400 lb of trailer towing with rear wheel drive. Pricing starts at $29,195, with AWD adding $2,000 to the price regardless of trim level. The Crew costs $4,000 more than Express; CrewLux package starts at $9,000 more than Express, or $38,195. The top of the line Durango Citadel is $41,795… with rear wheel drive. Add $850 for the destination charge to all those numbers. Durango R/T starts at $35,465 plus destination, while Durango Heat starts at $30,500 plus destination. Durango Heat adds five horsepower to the regular Durango V6. As an example, a Durango Crew with AWD lists for $35,195; the dealer invoice price is $33,307 (without considering holdback and other incentives). Adding Customer Preferred Package 26G would add $5,000 to the price, with a dealer invoice cost of $4,450. The destination is $850 (for both dealer and customer). The new Durango has 28 different seating configurations, with up to 85 cubic feet of cargo and storage areas. With second- and third-row seats folded flat, the Durango can fit a 6-foot couch with room for a coffee table, or enough 10-foot 2x4s to build a tree house. Visibility over the third row was achieved by creating a button to drop the headrests when the third row is not in use. As expected, the Durango will have an optional Hemi V8 providing up to 7,400 pounds of towing, while the standard V6 provides best-in-class V6 towing at 6,200 pounds; both have standard trailer sway control, and both engines have variable valve timing and are available with all wheel drive. Benchmarked against premium performance SUVs, Durango has a unibody structure consisting of 52% advanced, high-strength steels; it integrates the suspension with the body, reducing flex when compared with the previous body-on-frame design. More than 5,500 welds and more than 4,100 mm of arc welding contribute to torsional stiffness levels greater than the Mercedes-Benz GL. Every path that leads to the interior is sealed in one or more ways and joints are made as tight as possible by using sealer between panels, which expands during the paint process. A double wall separates the engine bay and the cabin to limit the noise. The new short/long arm front suspension and isolated multi-link rear suspension features isolated front and rear cradles for improved on-road handling and comfort. Aggressive shock and spring rates and large sway bars handle body roll in hard turning. Available electro-hydraulic performance steering and standard electronic stability control contribute to grip and stability. A drag coefficient of approximately 0.35 enables an aerodynamic improvement of more than 14% over the prior Durango, contributing to quiet interior and improved fuel efficiency. Standard safety features include standard front seat-mounted side air bags and standard side-curtain air bags that cover passengers in all three rows, active head restraints and Electronic Stability Control; options include Blind-spot Monitoring, Rear Cross Path detection, Forward Collision Warning, Adaptive Cruise Control, and Keyless Enter-n’ Go. The new Dodge logo on the steering wheel is eerily similar to the one created by JackRatchett and featured on Allpar weeks ago. Our unnamed source’s estimates of prices similar to the Grand Cherokee, with the invoice price within $2,000 – $3,000 of retail depending on model, appears to have been accurate. Most buyers will probably check in at the Express or Crew level; Crew, at around $3,500 more than Express, has many more standard features. All wheel drive adds around $2,000. The standard gear ratio will be 3.06, with 3.09 optional and 3.45 on the Hemi. The Hemi V8 will be optional on all models, for around $2,000 extra on Express. Europeans will use a 2.8 liter VM Motori diesel at 195 hp, as well as the Pentastar gasser, according to “mrmopar;” both will use the W5A580, not the 545RFE. Overall, the pricing reflects the balance between a larger vehicle and lower off-road capacity. Given the expected high-end interior and feel of the 2011 Durango, which will have a standard 290-horsepower Pentastar V6, and the daunting list of standard features, the pricing is definitely reasonable. That said, these numbers were not provided by an “unquestionable” source, and pricing may be higher or lower than described here. Pricing will, regardless of whether these numbers are accurate, be “real” — customers should not expect a rebate to be slapped on the hood just after the car appears at dealerships. We expect the Hemi V8 to add around $1,500 and a navigation system to add $750. Stephen Weigel “fleshed out” patent drawings for a more realistic view of what the actual vehicle might look like. His illustration is almost identical to the actual photo, taken weeks later. The R/T has the 5.7L VVT Hemi. The hot new 3.6L Pentastar has the Mercedes W5A580 5-speed auto transmission and the 5.7L VVT Hemi (with the proven Chrysler 545RFE five-speed transmission). They are built, along with Grand Cherokee, in the North Jefferson plant. Seating configurations will be for five or seven passengers. The front passenger seat can be folded flat, the second row will have a 60/40 fold and tumble seat, and the third row seat will include headrests that can be lowered by the driver for a better rear view. The new Magnum will also be available without the third row seat if desired. The Wall Street Journal wrote about a Chrysler Citadel, a hefty misunderstanding confusing the Chrysler Citadel concept — which became the Pacifica — with a possible matching Citadel model of the Dodge Grand Caravan. Hill Start Assist, Proximity Keyless Entry and push button start. Seating configurations are for five or seven passengers. The front passenger seat can be folded flat, the second row will have a 60/40 fold and tumble seat, and the third row seat will include headrests that can be lowered by the driver for a better rear view. The new Durango started arriving in showrooms in late 2010, built in the renovated North Jefferson plant. Dealershipforum.com was right about the name being Dodge Durango. oh2o wrote that the Crew and models will have an accent color grille with chrome insert; the Heat and R/T will have a body color grille with accent color insert; the Citadel (Boulevard) models will have an all-chrome grille. While some said an insert like the one on the right would be present, others said there would be no logo-type inserts, and that the place where they normally appear would simply be blank. The Dodge name, in letters, is to be the only brand badging, which is consistent with photos of the new Charger and Challenger. JackRatchett posted an absolutely accurate rendition of the new Dodge logo, without having seen it. The 2012 Dodge Charger SRT8 (starting at $46,660, with a lower-cost Super Bee version starting at $41,495 plus destination) uses the new 6.4-liter HEMI® V-8, boasting 470 horsepower and 470 lb.-ft. of torque. A new active valve exhaust system allows the cylinder cutoff system to engage over a wider range, increasing gas mileage (by 25% on the highway), while an active intake manifold and high-lift camshaft with cam phasing provides maximum low-end torque for impressive standing starts while optimizing high-end power. The hood is functional (as predicted by Allpar) — instead of a scoop (which is more about looking good than performance according to Gilles) it relieves negative pressure under the hood which helps cornering at speed. The new engine is all about torque, which is moved “way, way down” in the torque curve. At the lower rpm range, there’s an 80-90 lb-ft torque improvement. Ralph Gilles said that the Charger has a highly respectable 0.29 cD (aerodynamic coefficient — this compares favorably with most cars). City mileage went up over 15% and highway over 25%, without giving up anything in overall performance. For the first time in any Chrysler SRT car, a standard paddle-shifter joins the AutoStick system, using the W5A580 five-speed automatic transmission. (The same transmission, without paddle shifters, is used in the standard Dodge Charger.) The transmission can be used on full automatic, in normal or sport modes; or manual shifted via paddle shifters or console (AutoStick). In Sport mode, the system is on full manual, while on Auto mode, it appears to function as an electronic range selector. The 2012 Dodge Charger SRT8 Super Bee debuted in Stinger Yellow or black, reprising the legendary Super Bees. It has a dash plaque, black rear spoiler, glossy-black split crosshair grille, and Z-stripe cloth seats with striping and embroidered Super Bee logos. On the yellow car, black hood graphics and decklid stripes are used with a solid wide center line flanked by tracer lines; the black car has charcoal gray graphics on the hood and decklid. Front fenders have “392 HEMI” badges; rear fenders have the Super Bee graphic. New 20 x 9-inch, five-spoke cast-aluminum wheels with black pockets come with a choice of Goodyear F1 Supercar three-season, ultra high performance tires and (standard) Goodyear Eagle RS-A 2 all-season tires. “Redhed” wrote about what buyers give up when they buy a Super Bee: active exhaust, adaptive dampers (the Super Bee uses regular Bilstein dampers), forged aluminum wheels (the Super Bee’s are cast), leather, navigation (not even optional in the ’Bee), heated and cooled cup holders, twelve-way memory driver’s seat (a six-way non-memory seat is subbed in), heated seats and steering wheel, and front-seat ventilation. Some items are moved from being standard to being optional: HID headlights, automatic dual-zone climate control, remote start, satellite radio, and, oddly enough, paddle shifters. Several regular SRT8 options can’t be ordered at all, including a sunroof, the Driver Confidence Group (rain-sensing wipers, a rearview camera, blind-spot monitoring, auto high-beams), and the Adaptive Cruise Group (adaptive cruise control, forward collision warning). To control that power, the Dodge Charger SRT8 features an adaptive damping suspension that uses a wide range of on-road and driver inputs, such as vehicle speed, steering angle, steering speed, brake torque, throttle position and lateral acceleration, to automatically tune the suspension for specific conditions. Drivers also can manually choose between “Auto” and “Sport” settings that quickly change the shock damping and harshness characteristics from the ease of everyday commuting to harsher, more challenging driving situations. (Sport mode keeps the damping firmer). The performance SRT-tuned, fully hydraulic steering system also is improved with a new, heavy-duty pump and revised gearing to give drivers more direct feel and on-center response. New, split five-spoke, 20-inch lightweight forged and polished aluminum wheels with black painted pockets provide great looks, and the available three- or four-season tires make the 2012 Dodge Charger SRT8 easy to handle and fun to drive. World-class stopping power for the 2012 Dodge Charger SRT8 comes through four-piston Brembo calipers and vented/slotted rotors measuring 14.2 inches up front and 13.8 inches in the rear. Knock back mitigation prepares the brakes for faster use, based on lateral g-forces and possibly other inputs. The Charger SRT8’s Ready Alert Braking system anticipates situations when the driver may initiate an emergency brake stop and engages the electronic stability control pump to set brake pads against rotors in order to decrease the time required for full brake application. A closer look at a sample 2012 Charger SRT8 shows some interesting features, including a 226mm rear axle with a 3.06 ratio, acoustic solar control glass all around, HID headlamps (with high-beam DRLs), a “functional hood scoop,” capless fuel filler, knock back mitigation, and tip start. New front and rear fascias, along with a new rear spoiler, distinguish the 2012 Dodge Charger SRT8 with a high performance look. The front grille, grille surround, and Dodge crosshair use high-gloss black finishes, while a new hood uses a 6.4 L (liter) badge and black air exhauster for added engine cooling. The functional hood scoop solved no performance problems; while the hood exhauster does solve a pressure issue. In the rear, the Charger’s new signature “racetrack” taillamp design with 164 illuminating LEDs has new 4-inch round dual exhaust tips and an SRT8 decklid badge. Side-sill cladding is painted to match the body color, and an underbody belly pan has integrated brake ducting to improve cooling and brake fade performance at all four corners. Luxury is there with dual zone humidity-sensing automatic climate control, a heated steering wheel, heated fron and rear seats, air filter, LED interior lighting, ventilated front seats; heated/cooled front cupholders, and other, more pedestrian features, not to mention a stunning 900 watt stereo with 19 speakers, with an antenna built into the rear window. Some other features include a black/red interior, adaptive cruise control (described in our 2011 Charger review), forward collision mitigation (using the sensor installed for the adaptive cruise), remote USB port, satellite traffic, and remote gas-cap release. Some of the features listed here may be options, but the SRT models generally come well equipped regardless. A new, leather-wrapped, SRT-exclusive steering wheel has a rim section with a flattened bottom surface that showcases the SRT logo. The standard paddle shifters flank both sides of the new steering wheel behind the new contoured palm rests. For the high-performance look, carbon-weave, fiber aluminum interior trim pieces are integrated into the new instrument panel and shifter bezel. The front seats have unique, aggressive bolstering and perforated suede insert fabric to help “grip” the driver and passengers, keeping them in place during spirited driving. Heated and ventilated front seats are standard. Reactive headrests also are standard. The SRT logo is embroidered in the seat backs. Front and rear seats are heated for passenger comfort; modified door trim panels feature unique bolster material and accent stitching on arm rests to match the seats. New for 2012, the Dodge Charger SRT8 uses a 900-watt, 19-speaker premium SRT performance audio surround-sound system from Harmon Kardon. The user interface is controlled with the largest standard touchscreen display (8.4-inch) in the segment. Benchmarked against the best E-segment sedans from Europe, Asia and North America, the easy-to-use system also features Uconnect Voice to deliver world-class functionality to keep all passengers easily connected, comfortable and secure. Performance Pages were revised for 2012 and moved to the UConnect screen. The instrument panel display can be customized to view driver preferences and expanded to include instant feedback on steering input measurements, horsepower, torque, expanded engine information, along with 0-60 mph time, 60-0 braking, g-forces and one-eighth mile and quarter-mile times. The color graphic Electronic Vehicle Information Center also includes the Performance Pages timers and added engine information. For everyday commuting, the 2012 Dodge Charger SRT8 incorporates features like Keyless Enter-N-Go, adaptive-cruise control with Forward Collision Warning and Blind-spot Monitoring with Rear Cross Path Detection, to keep drivers and passengers secure. The 2012 Dodge Charger SRT8 also features tip start, which is esentially automated starting — the driver turns the key to the start position and releases it, and the computer takes over from there, cranking until the engine catches and releasing it. This is presumably an outgrowth of pushbutton starters. Standard front-row reactive head restraints, standard full-length side-curtain air bags, driver’s knee bag and standard front seat-mounted side-thorax air bags offer enhanced occupant protection to passengers in the event of a collision. Standard three-mode electronic stability control with segment-exclusive Ready Alert Braking and Rain Brake Support safety features, offer improved overall vehicle handling and performance both on the road and the track. The 2011 Dodge Charger was released in October 2010, with more styling from the late-1960s Dodge Charger. [2011 Dodge Charger R/T review / test drive] The base engine is now a 292 horsepower V6, with 8-speed automatic managing 21 mpg city, 31 mpg highway — yet zooming from 0 to 60 in a mere 6.6 seconds. The 2012 Dodge Charger SRT8, with 465 horsepower, has a different look to match its different engine; and the Dodge Charger Fast Five Edition, 2012 Dodge Charger Blacktop, and Mopar ’11 Charger both have different looks and features. The Dodge Charger Blacktop is new for the 2012 model year. It will be available in SXT or SXT Plus trim, in black, tungsten, or bright silver. The car has sport seats (cloth or leather), 20-inch gloss-black aluminum wheels, a gloss black grille, 506-watt stereo with 9 speakers including subwoofer, paddle shifters, and sport mode (which changes transmission shift points). The eight-speed shifter drops 0-60 times to 6.6 seconds, with 21/31 mpg. Hemi gas mileage has been aided through “interactive deceleration fuel shutoff,” which cuts all fuel to the engine around 5% – 8% of the time the Charger is moving (according to Police Fleet Manager). Dodge Charger SE / SXT Rallye and Rallye Plus. Rallye adds 18 inch polished wheels, 8.4 inch stereo/Uconnect, 8-way powered driver’s seat, heated front seats, remote start, fog lamps; Plus adds leather, power passenger seat, heated rear seats, and more. Ralley is $28,245; Rallye Plus is $29,995. Charger R/T and R/T Road & Track add 5.7 Hemi (372 hp, HID headlights, rear spoiler; Road & Track adds unique grille, 20-inch wheels, spoiler, badging, performance exhaust, and more). R/T is $30,995 RWD. The R/T Plus adds $2,000, AWD adds $2,150, Road and Track adds $3,000, and Max Package adds $5,000. Dodge Charger SRT8 adds, among other things, the 465 horsepower Hemi V8. SRT8 is the basis for the Super Bee model. At these prices, Charger competes almost directly against the Ford Taurus, SE to SE, Rallye to SEL V6, R/T Plus to Ltd V6. The re-engineered 2011 Dodge Charger, an E-segment sedan, has a new “split crosshair” grille, a new, sculpted body, and better aerodynamics as a result of wind tunnel testing; aero changes include a lower hood line, faster windshield, raked headlights, tighter wheel openings, lower sill, and flat underbody. The aluminum hood has dual “scallops,” while body-side scallops deliver an undulating A-line across the doors. Running front to rear is the iconic horizontal “coke bottle” or “double-diamond” body-side styling that creates a tapering silhouette accented with muscular front and rear fenders, giving the Dodge Charger a distinct profile. Defining the fastback’s wide stance is a new taillamp design that incorporates 164 illuminating LEDs to form its signature “racetrack” graphic and gives the new Charger its unmistakable character from blocks away. Using its world-class structural stiffness, Dodge Charger engineers were able to tune the cabin for sound quality (rather than sound level) by isolating powertrain, road, and wind noise. Charger’s unibody includes dual-pane acoustic windshield and front-door side glass, body-cavity silencing foam, under-flush roll-framed doors with triple seals, and acoustic wheel-well liners to absorb road noise and quiet the cabin. The result is among the best sound quality in the E-size segment. As the Dodge brand’s flagship, the chassis of the 2011 Charger was engineered and tuned to deliver “a level of quality, capability and refinement that rivals the very best European, Asian and North American E-segment sedans.” The suspension has a new geometry making for a nimble, balanced chassis. The 2011 Dodge Charger’s interior has premium materials throughout, and a new thick-rimmed three-spoke Dodge steering wheel for enhanced performance feel and grip. Four available distinct interior color combinations (one apparently including red seats) feature soft touch surfaces. Electronics include Garmin® navigation, dual-zone climate controls, and the ability to check fuel prices with the integration of available SIRIUS Travel Link. …most seats start out with a stamped steel seat bottom. To that, different layers, thicknesses and densities of foam are added. That means seat comfort comes only from the foam layers. The most comfortable seats, however, start out as a tube frame with a nylon web seat the bottom. And that is what the new Charger has. The 2011 Dodge Charger also has better foam layers, with the webbing covered with a layer of firm foam, then a layer of memory foam. The 2011 Dodge Charger features more than 65 safety and security features, including standard Keyless Enter-N-Go and Electronic StabilityControl (ESC) with segment-exclusive Ready-alert Braking and Rainy Day Brake Support safety features to improve overall vehicle handling and performance both on and off the track. Safety and security features available for the first time on the Dodge Charger include adaptive-cruise control (ACC) with forward-collision warning (FCW), blind-spot monitoring (BSM) with rear cross path (RCP) detection and ParkView™ rear back-up camera with grid lines, all designed to provide the driver with added confidence while behind the wheel. While somewhat less powerful than the same engine in the 2011 Dodge Challenger, the Pentastar V6 is far more powerful and quieter than the 250 horsepower 3.5 liter, with better gas mileage; and has better acceleration than most of the “original” Dodge Charger V8 cars could provide. Built at the Brampton Assembly Plant in Brampton, Ont. (Canada), the 2011 Dodge Charger arrives in showrooms in the fourth quarter of 2010. Brampton will also build the 300C, Challenger, and, many believe, the Alfa Romeo Giulia and a Lancia 4-door sedan identical to the 300C except for badging and grille. Delivering performance and an even more aggressive look, the 2012 Dodge Charger Redline is a 426 HEMI®-powered showcase of new Mopar® performance kits that will arrive later this year. The Dodge Charger Redline vehicle with all three Mopar performance stage kits will debut at the 2012 North American International Auto Show. Based on the 2012 Dodge Charger R/T, Mopar’s Stage I modifications include a Mopar carbon fiber chin spoiler; and, matching the Redline Tri-coat paint, a grille surround with black signature “crosshair” insert. 20 x 8-inch black Mopar wheels have polished accents. Carbon fiber door scoops include heritage “R/T” badging. A three-piece Mopar carbon fiber rear spoiler adds downforce and provides a more dynamic look, while a vinyl roof graphic in matte black is there just for show. The Dodge Charger Redline’s interior has a Mopar aluminum shift bezel and aluminum instrument panel bezel with Redline perimeter accent. Mopar pedal covers are made from stainless steel and have a rubberized pattern for improved traction. Increasing power from the Dodge Charger Redline’s HEMI® V-8 engine, Mopar’s cat-back performance exhaust system delivers a menacing “throaty” sound. Under the hood, a front-tower cross-brace and front tower brace caps provide increased structural stability for improved handling dynamics. For ultimate braking capabilty, high-performance Mopar brake linings resist fade during hard use. The Dodge Charger Redline with 426 Hemi delivers 590 horsepower via a lightweight aluminum V-8 engine block that shaves more than 100 lbs. from the traditional cast-iron crate version. The new Gen III High Output 426 HEMI engine includes a stout, balanced lower reciprocating assembly with a forged-steel crankshaft (six-bolt mains are at 2, 3 and 4, and cross-bolted 4-bolt mains are at 1 and 5). H-beam style rods are made from forged steel and coupled to forged 11:1 compression ratio aluminum pistons. Included is a revised windage tray to increase oil dispersion and prevent oil aeration by the crankshaft. The Gen III High Output 426 HEMI engine’s valvetrain starts with a more aggressive roller camshaft with .639 intake and .628 exhaust lift and cylinder heads that feature the latest designs for exceptional flow characteristics. To help stabilize the valvetrain at high engine rpm, tie bars are available. Mopar cast-aluminum valve covers and billet fuel rails are also included in the Dodge Charger Redline’s Stage III performance kit. The Mercedes automatic may be upgraded to seven speeds — after the cars launch (maybe a year or two after). We have also heard the eight-speed previously thought to be “SRT only” will replace the five speed entirely. Europeans will, according to “mrmopar,” get a 3.0 V6 VM Motori diesel instead of the Mercedes V6 diesel, but it will still use the W5A580 transmission. In June 2010, we were told that the 2011 Dodge Charger will have an electric steering pump; sources say there will be no ignition key (or any place to put one) and no door key, with doors unlocking when a fob is sensed and a pushbutton starter (the keyless ignition may be an option or higher-model “feature”). Pilots were available for the Michigan State Police tests against the Caprice. The W5A580 5-speed automatic was, as we said, the only transmission offered when the 2011 Charger is launched. A ZF eight-speed automatic will reportedly join the V6 models in model year 2012; rumor has Chrysler licensing a seven-speed variant of the W5A580 for the V8s, or spreading the ZF eight-speed to all engines midyear or in model year 2013, or soldiering on with the perhaps unfairly criticized automatic.